Urmi is a Paediatric Occupational Therapist with over 12 years of experience having worked in private clinics, schools, an Autism Therapy Center, and is a Senior Occupational Therapist in a NHS trust. Urmi provides assessments, direct treatment, as well as consultations and training to parents and teachers on strategies to facilitate an inclusive education. She specializes in sensory integration and supporting children with Autism, Sensory Processing Disorder, ADD/ADHD, Developmental Coordination Disorder or Dyspraxia, Dyslexia, Down’s syndrome, and Global Developmental Delay. Some of her key strengths including combining multiple therapeutic approaches such as Sensory Integration, Picture Exchange Communication Systems (PECS), Visual aids, social stories and play strategies like Response Participation Attention Training Systems (RPATS). By using a creative and playful approach tailored to your child, Urmi helps them develop their skills and thrive whilst having fun. She can see your child in their home, nursery, school, or community setting. “This is to share our experience with Urmi. It’s been a blessing that Urmi entered our lives for our son Ishaan who’s now 12 years old. She started working with Ishaan early, when he was just 2 years old. Ishaan has Down’s syndrome and his motor skills and ability to perform tasks were a challenge as was his attention and ability to grasp things. But Urmi, with her knowledge, dedication and wonderful ability to connect and care for him, helped very early in his formative years. Today Ishaan is an independent and intelligent child who can perform most daily tasks, interact and play with other kids, and is doing very well academically. “My son has Down’s syndrome. I was really depressed when I came to know about Soham’s diagnosis and had no idea what to do or where to go. At that time we met Urmi who was so positive, passionate, and determined in her work. Soham was under her care for more than five years. She not only helped him but also me- by talking, explaining the reason behind doing each and every activity in therapy sessions. 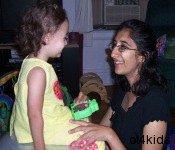 Urmi is a passionate and dynamic person. She has a special gift of connecting with people. She is a very dedicated professional with in depth knowledge about her work. She will be an invaluable asset to any organisation with which she is associated with.